Kentucky is suffering “WINTER STORM 2015” according to our local weather. Dramatic much?! It really is pretty snowy though. We have about 7 inches right now. Not much for the Yanks but a pretty good snow for us Kentuckians. Thankfully it is a light powdery snow so maybe we will keep our power throughout the night. The next few days promise to be miserably cold. I am not excited. I am excited about this salad though. It is delicious and beautiful. I can’t wait to take it to work. I won’t be tempted to order out when I know I have this meal waiting on me. In a large bowl, add the lettuce. 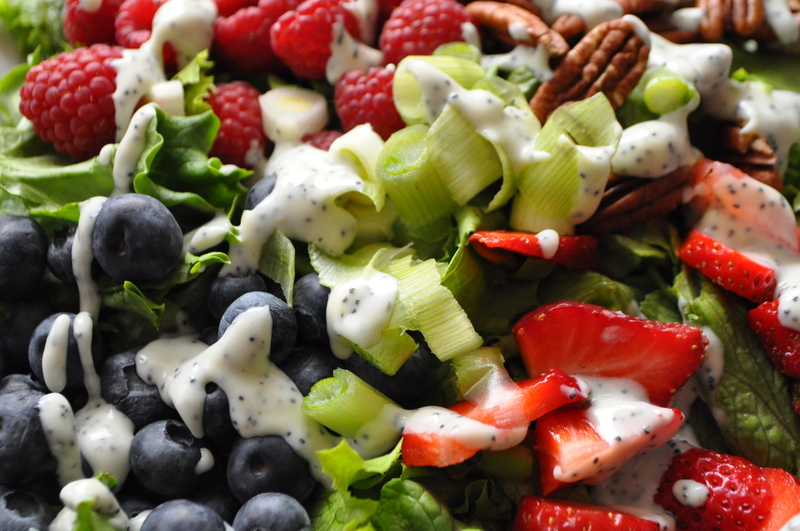 Top with berries, pecans, onions, and croutons. 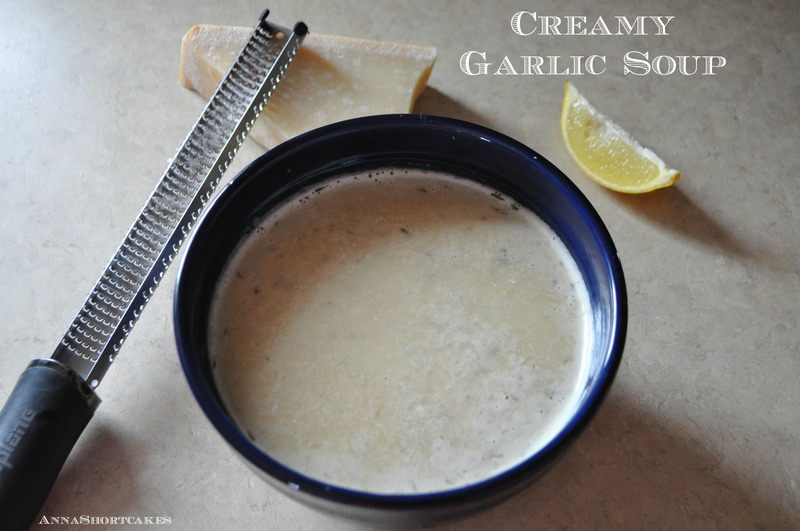 In another bowl, whisk the dressing ingredients together until smooth. Pour desired amount over salad. Serves 1. I listen to the America’s Test Kitchen podcast every week. I love that show! Practical advice, interesting interviews, and excellent audience interaction. I always learn something I didn’t know. A couple of weeks ago, the Test Kitchen reviewed prosciutto, an Italian ham that is dry cured in salt for at least 9 months. Apparently not all prosciutto is the same. Some American commercially sold prosciutto has ingredients similar to salami, which of course alters the pure umami flavor. The Test Kitchen tried several different brands and found that the prosciutto with the least number of ingredients (two – pork and salt) were the best. Luckily, Boar’s Head, the only brand available to me, is made of just those ingredients. 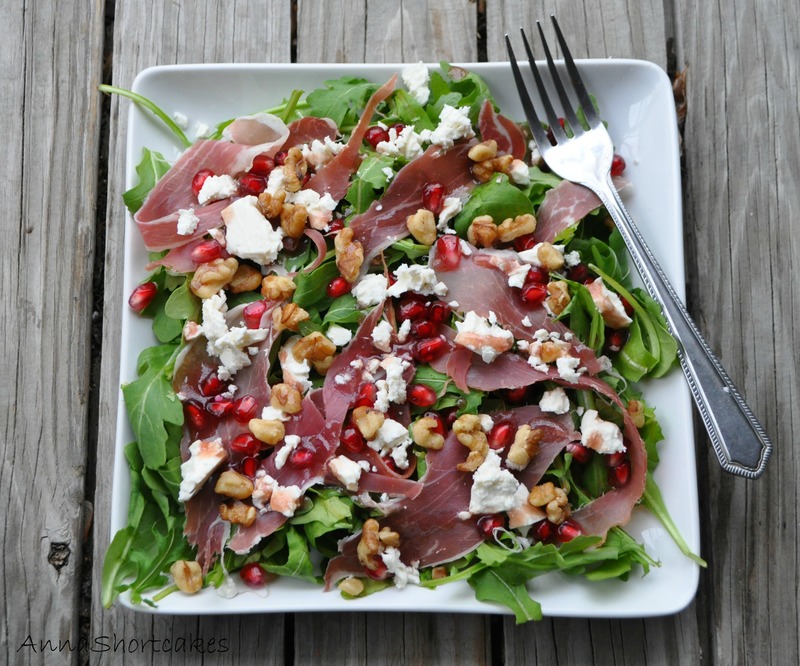 The saltiness of the meat and feta is offset nicely by the sweetness of the pomegranate, the spiciness of the arugula, and the buttery walnuts. On a plate, lay out the arugula. 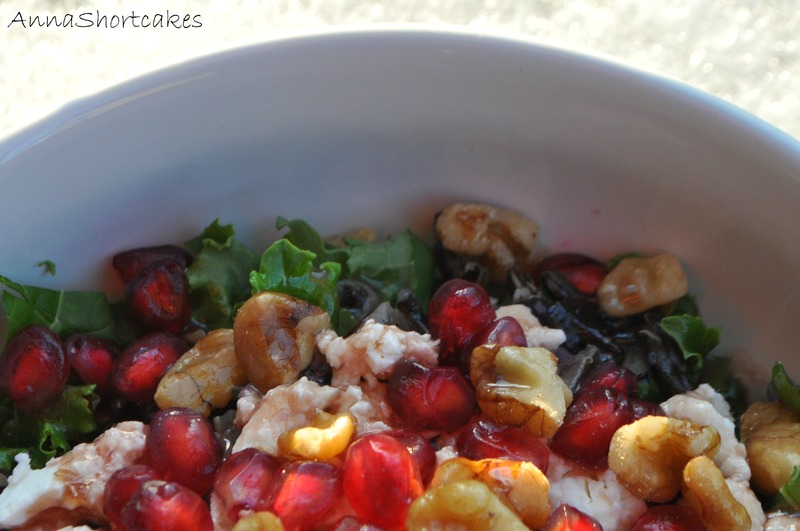 Top with the prosciutto pieces, pomegranate arils, feta crumbles and the walnuts. 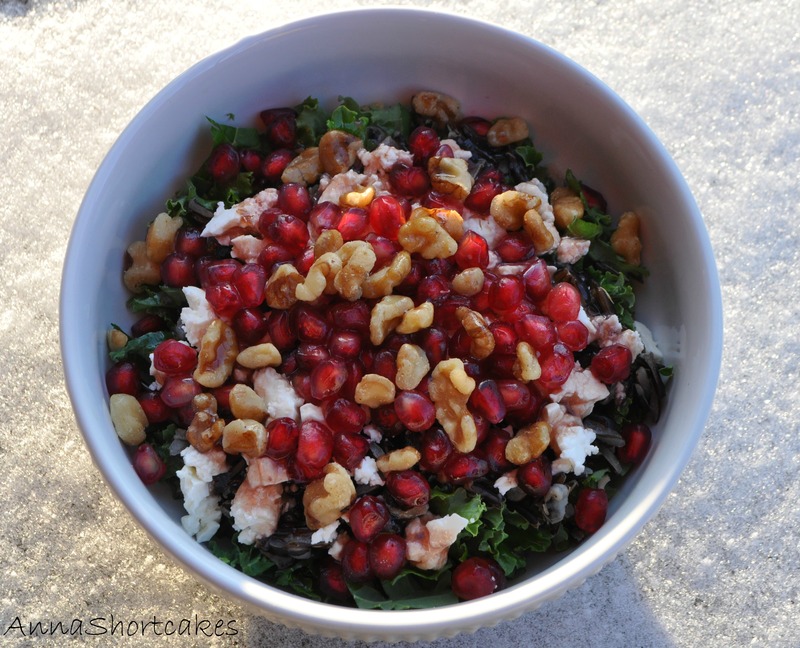 Dress with pomegranate vinaigrette. Serves 1 but could easily be multiplied. It is so cold here!! A record low of 24 today! All I can do is shake my head and seek solace in food. But as I mentioned earlier, I don’t want to gain extra weight before the holiday eats. 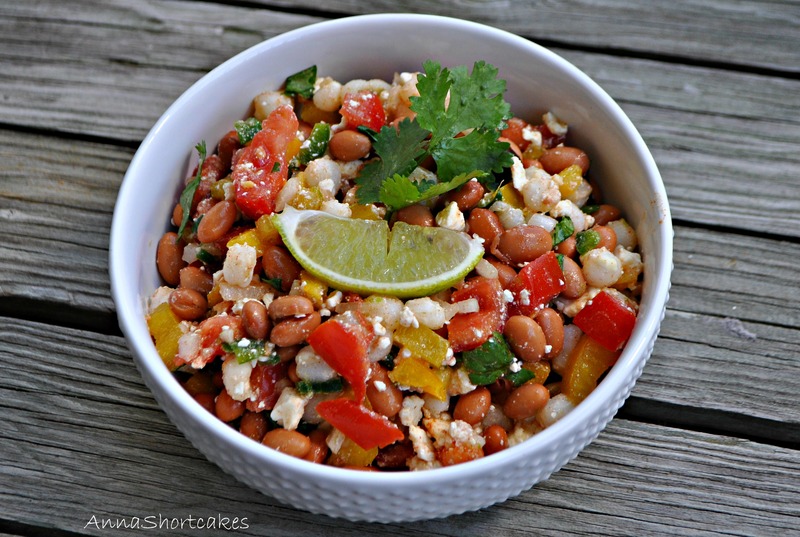 This salad is delicious, low calorie, and easy to assemble. If I was hosting Thanksgiving this year, I might consider serving a small version of this as first course. Prepare your salad ingredients and separate into 4 bowls. 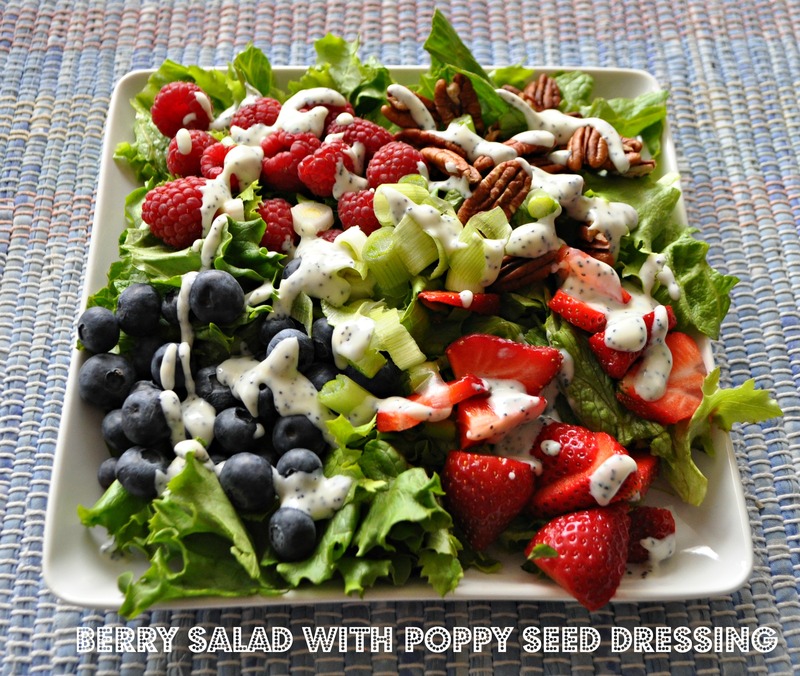 Top with desired amount of dressing. Look how beautiful the salad is up close! 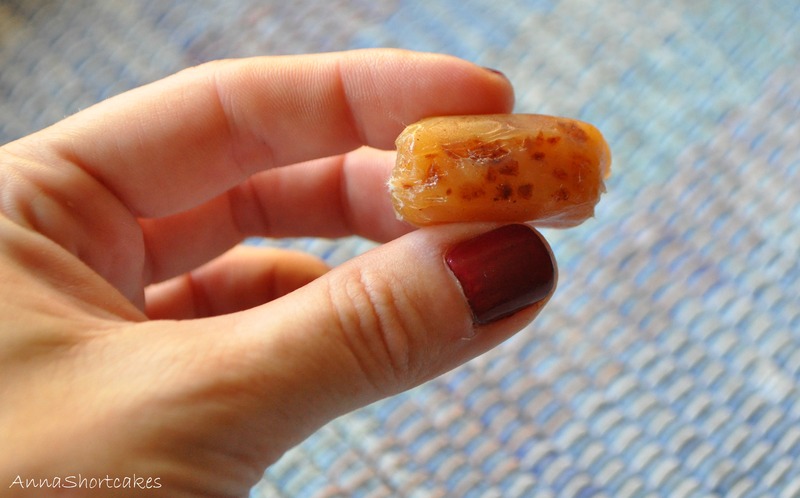 Apple Cider Caramels…. and Change…. Nothing ever stays the same. Even if you insist on standing still, the rest of the world continues to evolve and revolve around the sun. Some changes are good, some are bad, some are mix of both. I am sure you have noticed I have been MIA from blogging for a good while. In short, my husband and I are in the process of divorcing. It has been difficult. I am trying to sort through my life, piece by piece. One of the most consistent things in my life has been my continued passion for food. I haven’t been blogging but I have still been creating and cooking my own food. I have still been connecting with fellow foodies. My passion for food remains unchanged. I have missed connecting with the blogging community. I have missed showing my readers my culinary discoveries. I have missed being pushed to continue creating and exploring the wide world of food. But I am back now!!! This month I want to embrace the best of the fall season. The amazing fresh produce – apples, pumpkins, greens, and root vegetables. Today’s recipe is one I have been eyeing for a long time. These caramels are a flavor explosion in your mouth, buttery smooth with a bright apple taste and little hints of salt at the finish. Boil the apple cider in a 3 to 4 quart saucepan over high heat until it is reduced to a dark thick syrup between 1/3 and 1/2 cup in volume. This takes about 35 to 40 minutes. Stir occasionally. Meanwhile, line the bottom and sides of a square metal baking pan with parchment. Set aside. Stir the cinnamon and salt together in a small dish. Remove the reduced cider from the head and stir in the butter, sugars, and heavy cream. Return the pot to medium-high heat with a candy thermometer attached to the side, and let it boil until the thermometer reads 252 degrees, only about 5 minutes. Keep a close eye on it. Immediately remove caramel from heat, add the cinnamon-salt mixture, and give the caramel several stirs to distribute it evely. Pour the caramel into the prepared pan. Let it sit until cooled, about 2 hours. When the caramel is set, remove the caramels from the pan and use the well oiled knife to cut the caramel into 1 by 1 inch squares. Wrap each one in a 4 inch square of waxed paper, twisting the sides to close. Caramels with be soft at room temperature and firm in the fridge. Makes 64 caramels. Thanks to Boyd’s Orchard for the fresh apple cider. I am sort of getting bored with my usual water or lemon water that I drink each day. I don’t want to add very many calories though. I mean, that’s sort of the point of water – low calorie hydration. This recipe is a knock off of the popular Starbucks drink but much cheaper. And with only 77 calories per recipe, this is way better for you than soda! In a large glass measuring cup, add two cups of water. Place in the microwave and heat to a boil. Add the tea bags, sugar, and vanilla extract to the hot water. Allow to steep for 15 minutes. Remove the tea bags and let sit on the counter until a bit cooler. Refrigerate until cool (about an hour). 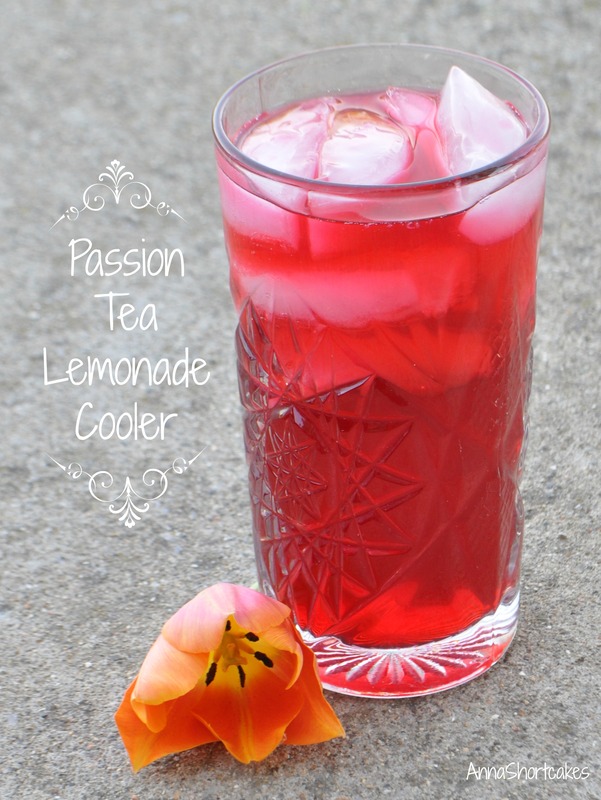 In a large glass, add the tea, lemonade, and lots of ice. Makes one very large cup or two average size water glasses. I know it is hard to believe that these fries are crispy without being fried. I promise you that they are! The spice, the crunch, and the delicious toppings make for an amazing side dish without the unnecessary extra calories. Preheat oven to 400 degrees. Slice each potato horizontally then slice into fries no thicker than 1/4 inch thick. Add them to a bowl and toss with olive oil, salt, and pepper. On two parchment paper lined baking sheets, lay out the potatoes in a single layer, making sure none of them touch. Bake for 30 minutes. While they are baking, in a small bowl, combine the spices. When 30 minutes is up, remove and turn up the oven to 425 degrees. Pour the fries into a large bowl and toss with the spice combo. Place baking racks on each baking sheet, spray with cooking spray, and lay out the potatoes in a single layer again. Bake for 10 to 15 more minutes or until crispy. Remove the potatoes from the oven and spread out on a large plate or serving platter. Top with the cheddar cheese, bacon crumbles, sliced green onions, and sour cream. Serves 4. From now on, let the winter of 2013-14 be known as the “Unending Winter.” It has made me blue and miserable. Oddly enough, it has even put a damper on my desire to cook. I just want to hibernate under the covers with a good book. After a week of my pouting, it is clear Mother Nature just doesn’t care that I am sad. So I will shake the dust snow off of my feet and keep going. The first recipe in my recovery is bright, flavorful, and easy to construct. 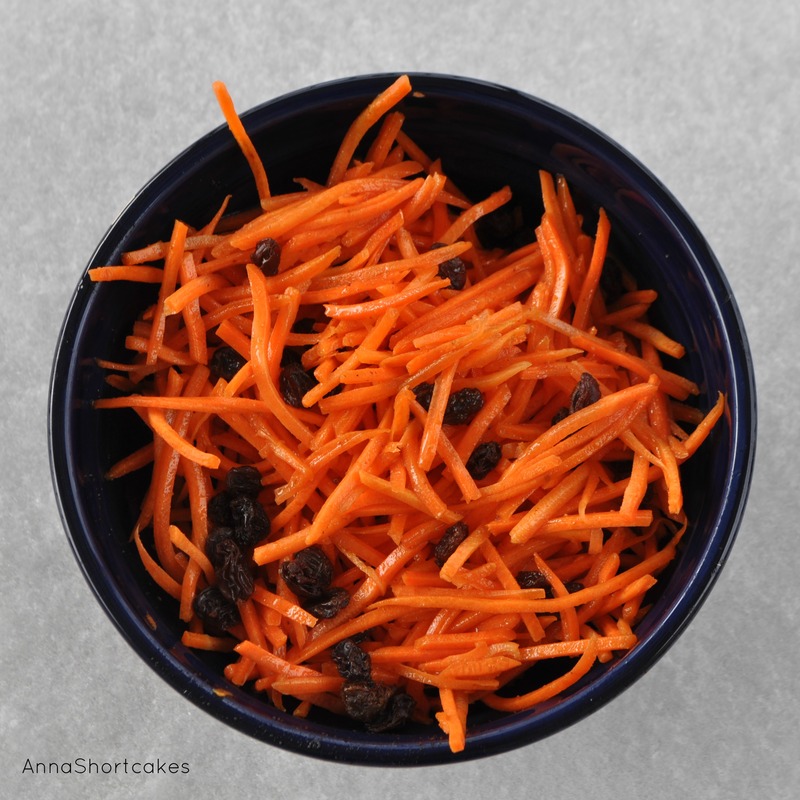 I love the contrast of the spice with the sweetness of the carrots and raisins. In a small bowl, combine first six ingredients. Pour over carrots and raisins. Stir to coat. Refrigerate until serving. I apologize for being so scarce as of late. I have been working a lot and have been extra tired. I think it must be this gloomy weather. I have been cooking but at odd times not very conducive to good photography. 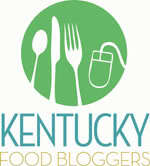 I have several recipes I can’t wait to bring you. 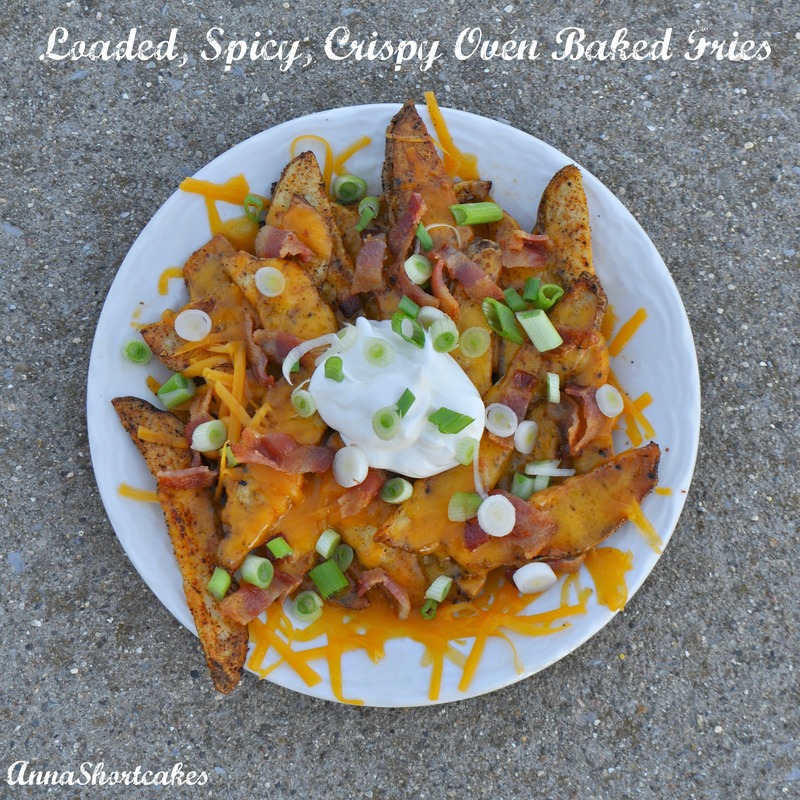 This recipe is one of the best new recipes I have tried in a while. It is addictive! I made a batch for work. I think everyone asked for a copy of the recipe! You can tailor the heat level to your own preference. Next time I think I will make mine spicier! Love me some sriracha! Preheat the oven to 300°F. Line a baking sheet with parchment paper and set aside. Heat the oil in a large, heavy bottomed saucepan with a lid over high heat. After the oil has heated to shimmering hot, add in the popcorn. Cover with the lid and move the pot around occasionally to prevent the kernels from burning. 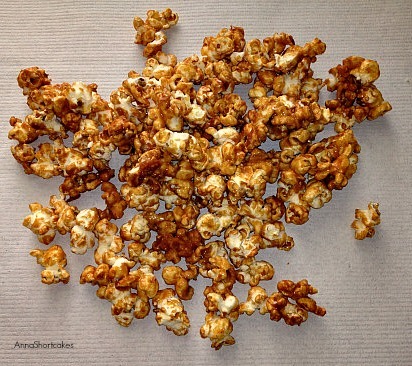 Once the popcorn starts to pop vigorously, keep vigorously shaking until the popping stops. At the same time you are popping the corn, melt the butter in a saucepan over medium-high heat, then stir in the brown sugar, molasses, and salt until combined. Bring the mixture to a boil and continue to boil for 4 minutes, without stirring. Remove from the heat and stir in the sriracha, cumin, and baking soda. Pour the sugar mixture over the popcorn, then toss together until evenly coated. Use a silicone spatula to do this as the caramel will be really hot. Spread the popcorn evenly on the baking sheets. Bake in the oven for 30 minutes, stirring the caramel corn every 10 minutes. Let cool completely before storing, breaking up any large clusters that may have formed. Store any leftovers in an airtight container or resealable plastic bags in a cool dry place. The popcorn will stay crunchy and good for a week but I know it won’t last that long. Serves 6. From Noms for the Poor. Preheat oven to 350°F. Place 26 garlic cloves in small glass baking dish. Toss them with the olive oil, salt and pepper. Cover the baking dish with foil and bake for 45 minutes, until golden brown. Transfer to a bowl and cool. Squeeze the garlic with your fingers to extract the cloves. In a heavy-bottomed saucepan, melt butter over medium heat. Add onions and thyme, cooking until they are translucent. Add the roasted garlic, the raw garlic, and chicken stock to the sauce pot. Cover and simmer until the garlic is very tender, about 30 to 40 minutes. Working in batches, puree the soup in the blender or using an immersion blender. Add cream and bring up to a simmer. Season with salt and pepper to taste. Divide soup between each bowl. Top with shavings of Parmesan and a squeeze of lemon. Inspired by this recipe.